If you’re one of the two people alive who hasn’t played Tetris in one version or another, here’s a brief rundown: Blocks of different shapes fall from the top of the screen, you have to rotate/move each into place and form lines, which will then be cleared. If they reach the top, it’s game over. That’s all there is to it, yet for some reason it can be ridiculously addictive – just like Slydris. Except, not really. You won’t be rotating blocks and they don’t fall at a constant rate either. Instead, every time you slide a block to the left or right, a single line will descend. This makes the whole thing play more like a relaxing puzzle game, unlike the fast-paced experience Tetris provides (surely no one plays on the slowest speed level, right?). That’s not to say Slydris is all about chilling with blocks though, because if you feel like cranking it up to eleven, there’s always Survival Mode. In Infinite Mode, a new set of blocks drops after every move you make, so take as much time as you want. Clear 25 lines to move onto the next level. Zen Mode functions similarly to Infinite Mode, but the difficulty is more dynamic, there are no achievements or scores to worry about, and your game will never end (in Infinite Mode, the game ends if the stack reaches the top row). 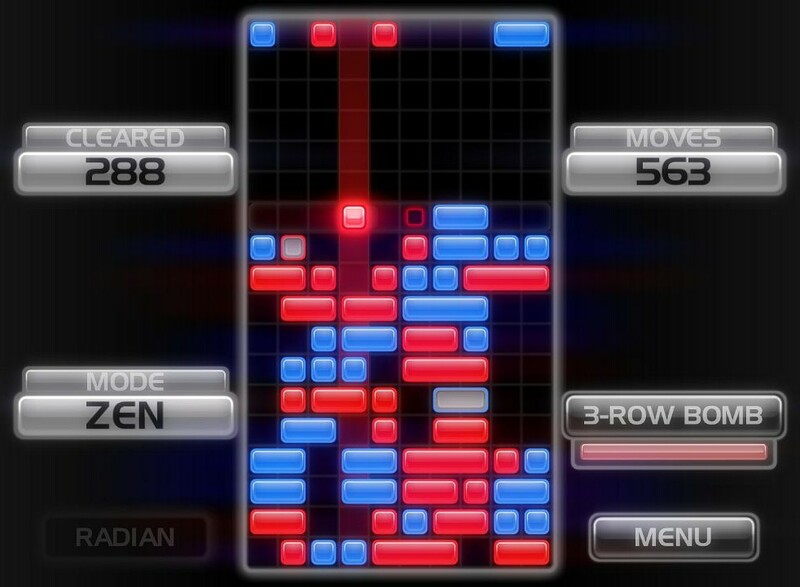 In Survival Mode, you have 10 seconds to make as many moves as you can to clear the lines of blocks, then a barrage of blocks will drop, and the cycle begins again. Quick thinking and nimble fingers are required to do well. There are also ‘special blocks’ to watch out for, including one that can’t be moved and the potentially even more annoying Magnet block, which stays at the same height, even if there are no blocks beneath it. Crazy stuff! Now, as the title says, this is but the first of quite a few (new and old) Radiangames titles heading to Google’s mobile OS: Inferno+ (my review) and Ballistic SE should be available on Android “in the coming weeks”, along with the brand new game, Bombcats. Good times ahead for mobile gamers.